Auxetics comes from the Greek auxetos, meaning: which can expand. The term indicates a class of materials and structures which expand when subjected to a tensile loading, counterintuitive to most of the materials we are familiar with. In recent years, auxetics has been used also to describe materials and structures with negative characteristics, such as negative thermal expansion, negative stiffness and compressibility. During the talk several classes of auxetic materials will be described, ranging from foams to composite and cellular structures. Emphasis will be placed on design, modeling and production aspects for multifunctional applications. We will show examples related to vibration and sound absorbers, high structural integrity composites and honeycombs, and morphing wing and space reflector applications. A case study will be also presented on zero Poisson's ratio cellular structures exhibiting zero and negative stiffness capabilities with large energy absorption under cyclic loading. Unusual deformation mechanisms in carbon nanotube heterojunctions and defective CNTs will be also presented, showing that negative Poisson's ratio can be also obtained at nanoscale level. Prof. Fabrizio Scarpa obtained a MEng in Aeronautical Engineering and a PhD in Machine Design at the Politecnico of Torino, Italy. 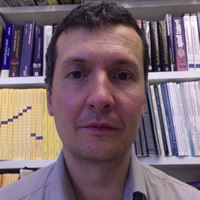 In 1997 he joined the Dynamics Research Group at the University of Sheffield to work in the field of negative Poisson's ratio materials for vibroacoustic applications. He then became Lecturer and Senior Lecturer at the Department of Mechanical Engineering of Sheffield working as Aerospace Departmental Coordinator and International Student Exchange Officer. He joined the Department of Aerospace Engineering in Bristol in 2005 where he is now Professor of Smart Materials and Structures. His research activities span the field of auxetics (foams and honeycombs), morphing technologies, vibroacoustics and nanostructures. Dr Scarpa is Principal Investigator in EPSRC, European Framework 6 and 7, Transfer Technology partnerships and DTI projects. He has collaborated in US Army ARO projects with Georgia Institute of Technology. Dr Scarpa is a Fellow of the UK Royal Aeronautical Society.